That's taking Jihad to a whole new level! Hope DHS is checking out the local zoos! Let's hear it for the monkey. As for the Iranians, not so much. Maybe the Israelis ought to use warheads made of Spam. OK. I read the article. Then I looked at the picture. Tell me if I'm wrong, but what I saw looked like a certain little tin horn dictator was taking a little suborbital jaunt on the taxpayers' rial. Dinnerjacket would have made a better payload. 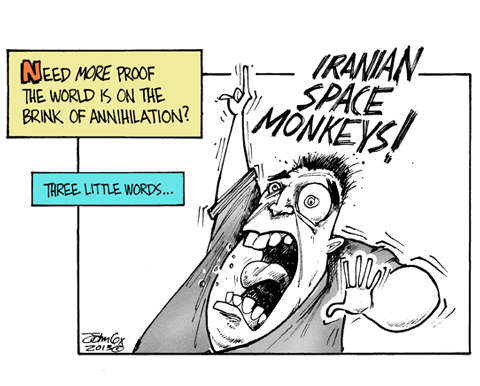 The Iranians could claim 1st place in the most BS lifted into space. This page contains a single entry from the blog posted on January 31, 2013 12:08 AM. The previous post in this blog was Dear Constant Viewers. The next post in this blog is Promo Illustration Idea.